The perfect segue book between Christmas and Thanksgiving! 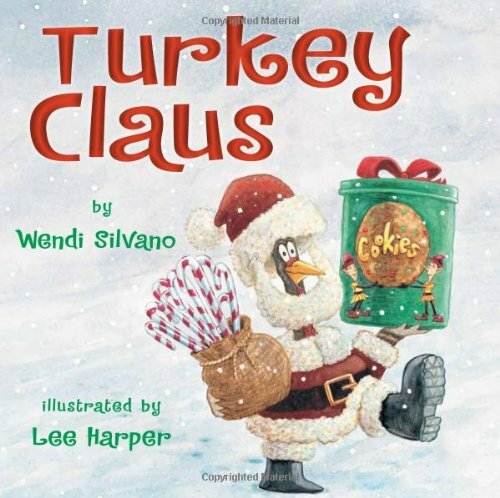 Turkey Claus, written by Wendi Silvano and illustrated by Lee Harper, begins with Turkey finding out that although he has escaped being the main course on Thanksgiving, Farmer is planning on serving him up for Christmas dinner! Turkey can think of only one person to save him, Santa, but getting close to Santa just before Christmas is nearly impossible. Turkey tries many disguises from candy canes to Mrs. Claus to sneak past the elves into Santa's workshop, but is caught every time. Will Turkey make it to see Santa before it's too late? Will Santa be able to keep Turkey off the Christmas dinner plate? This silly book is fun for all ages.